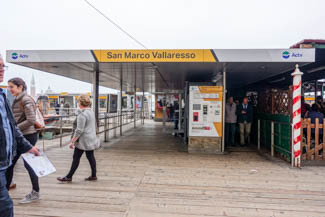 San Marco Vallaresso is the smaller and older of two waterbus stations near the Piazza San Marco (the other, S. Marco Giardinetti, is a few meters to the east in the satellite image above). Vallaresso has two pontili, or floating platforms, for boarding and exiting water buses. It also has a ticket booth and an ACTV ticket vending machine. To learn about hotels in the vicinity, please click here.